After Freedom 251 and Docoss X1, there is a new smartphone in the news, which is priced at Rs. 99. Yes, you read it correct, Namotel Achhe Din is priced at Rs. 99 only. If you are interested in this device, then you can visit www.namotel.com and book a device for yourself. Oh wait, is the website down? Of Course it is down. The website link has been changed to www.namotel.in. Like Freedom 251 and Docoss X1, Namotel website also went down in couple of minutes after the announcement about a Rs. 99 phone went viral. Leaving down the authentication of the company and website, let us give a brief glance on the specification of Namotel Acche Din mobile. It features a 4.0 inch IPS display with a resolution of 800 x 480 pixels. As expected it runs on Android OS. It is powered by 1.3GHz MediaTek Quad-core processor and 1GB of RAM. It has 4GB of internal storage which is expandable up to 32GB via micro SD card. The device is packed with 1325mAh battery which delivers 14 hours of backup time with normal usage. It sports a 2MP primary camera and a 0.3MP front facing camera. It is a dual SIM smartphone with 2G and 3G support. It has a plastic body and comes in Black and White color. Click here to open their official website. Fill up the form and do not forget to enter your Aadhar card number and mobile number. According to the company only one phone will be allocated to one Aadhar card number. You also need to upload your scanned photo and Aadhar card image for verification. Fill up other necessary details and click on “Register me up”. You can also find some other phones on Namotel website like, Aazadi smartphone at Rs. 1,999. 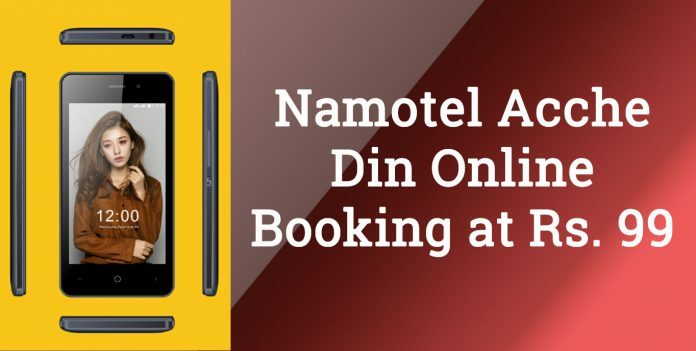 You can book Achhe Din phone at cash in delivery with some nominal shipping charges. Soon the company (Namotel) will be releasing their new phones, i.e. Uth Shine and F-Power. To get more updates on Namotel Ache Din smartphone, stay tuned with us.